Imported nuts from the United States are displayed at a supermarket in Beijing, March 23, 2018. China announced a $3 billion list of U.S. goods including pork, apples and steel pipe. China raised import duties on a $3 billion list of U.S. pork, fruit and other products Monday in an escalating tariff dispute with President Donald Trump that companies worry might depress global commerce. The Finance Ministry said it was responding to a U.S. tariff hike on steel and aluminum that took effect March 23. But a bigger clash looms over Trump's approval of possible higher duties on nearly $50 billion of Chinese goods in a separate argument over technology policy. The tariff spat is one aspect of wide-ranging tensions between Washington and Beijing over China's multibillion-dollar trade surplus with the United States and its policies on technology, industry development and access to its state-dominated economy. Beijing faces complaints by Washington, the European Union and other trading partners that it hampers market access despite its free-trading pledges and is flooding global markets with improperly low-priced steel and aluminum. But the EU, Japan and other governments criticized Trump's unilateral move as disruptive. The tariff hike has "has seriously damaged our interests,'' said a Finance Ministry statement. 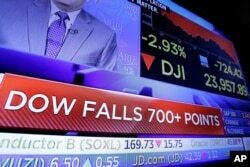 A television screen on the trading floor of the New York Stock Exchange shows the plunging numbers for the Dow Jones industrial average, March 22, 2018, as investors feared trade tensions will spike between the US and China. China's government said earlier its imports of those goods last year totaled $3 billion. "American politicians better realize sooner rather than later that China would never submit if the U.S. launched a trade war,'' said the Global Times, a newspaper published by the ruling Communist Party. Beijing has yet to say how it might respond to Trump's March 22 order approving possible tariff hikes in response to complaints China steals or pressures foreign companies to hand over technology.